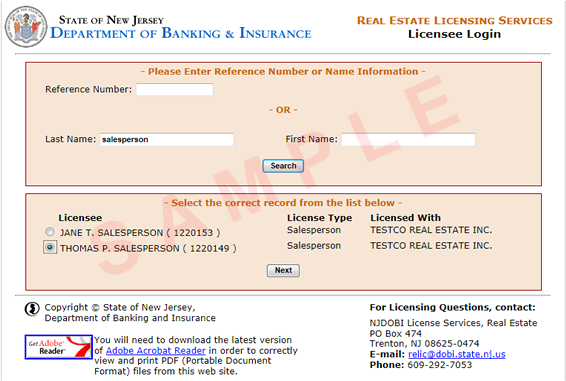 The renewal or reinstatement of your real estate license is dependent upon you successfully submitting your own online questionnaire (for the appropriate licensing period) to the Real Estate Commission (REC). This includes Brokers of Record (including Employing Brokers), Brokersalespersons, Salespersons, and Referral Agents. No paper questionnaires will be accepted. Until the questionnaire is completed, you will not be able to be hired by a Broker. Be Prepared Before You Start - What's involved in the Qualifying Questionnaire Process? 1. Read these instructions, then click on the My Qualifying Questionnaire link at the bottom of this page to begin the Questionnaire process. 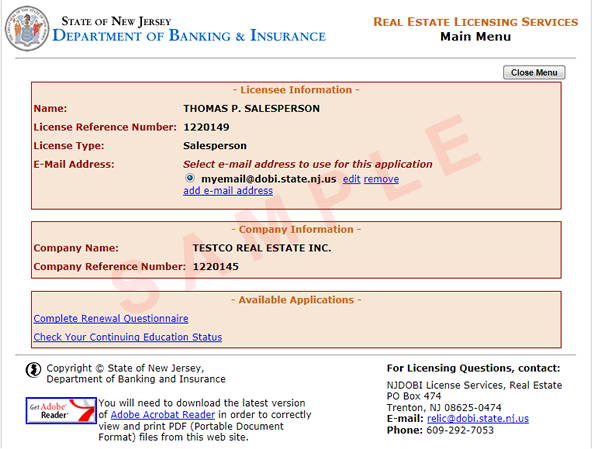 Enter your real estate license reference number in the field provided and click SEARCH (view sample login part 1 ). Note: If you do not know your reference number, enter your last name (first name optional) and click the SEARCH button. This will display all matching persons (view sample name search). Select yourself on this list (click radio button to the left of your name), then click the NEXT button located under the list of names. Once you click NEXT, you will be prompted to enter the last 4 digits of your Social Security Number and Date of Birth (view sample login part 2). If you are one of the few licensees who have been assigned a PIN, you will be prompted to enter your PIN instead of SSN and Date of Birth. 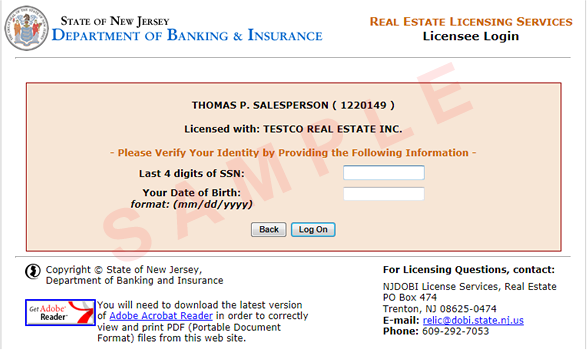 If you were not yet assigned a PIN or do not know your PIN, you can still login using your SSN and Date of Birth. 3. Once logged in, if you have never logged in before, you will be immediately prompted to enter a valid email address needed by the REC to send confirmational emails (view sample email Collection). 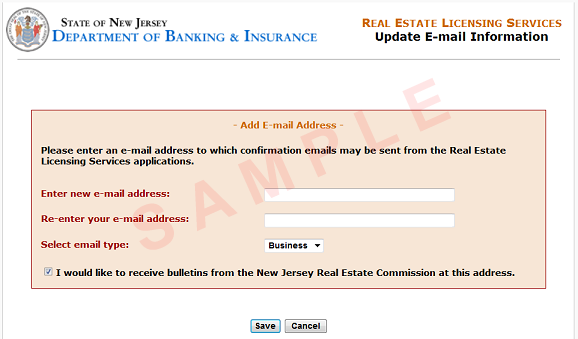 Once your email address has been entered and you click the SAVE button, you will be transferred to your online Real Estate Licensing Services Main Menu (view sample main menu ). 4. Next click on the "Complete Renewal Questionnaire" hyperlink which will bring you to the Questionnaire (view sample questionnaire) Please note the questions on the sample questionnaire may differ from the questions on the actual questionnaire. 5. Complete your Questionnaire by selecting the appropriate YES or NO checkbox for each question on the form then clicking the "Continue" button at the bottom of the form. 6. Click the "I Certify" checkbox at the bottom of the form indicating that you have answered all questions truthfully(view sample questionnaire certification ). 7. Click the Questionnaire's SUBMIT button. Note: Once submitted, you may log-in at any future time to view and/or print your questionnaire, however, no changes can be made. Question Supporting Documentation: Depending upon your answers to certain questions, you may be required to send in supporting documentation to the Real Estate Commission. If so, the necessary instructions will be displayed on your confirmation page and in the confirmation e-mail. If you fail to send any required supporting documentation, the Real Estate Commission may take legal action or initiate an enforcement action against your license. 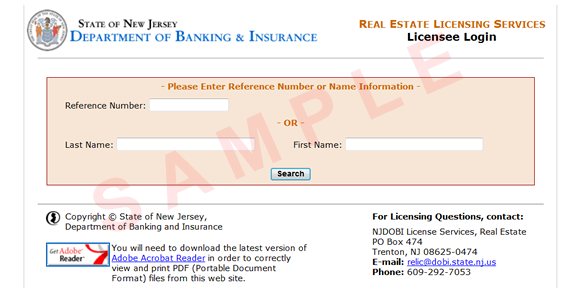 Brokers of Record may use either the link above to submit their questionnaire OR submit their questionnaire directly from their existing MyNJ Portal Account. Brokers of Record will not be able to hire any new licensee or submit ANY licensees for renewal or reinstatement until they have completed their own individual Questionnaire for the licensing period. A Broker of Record for multiple companies will only need to submit his/her Questionnaire once. The Questionnaire is specific to the person, not the company. If any Brokersalesperson, Salesperson or Referral Agent has not yet answered their Questionnaire for the licensing period, that person will not be available for hire, renewal or reinstatement. Question Supporting Documentation (instructions): Supporting documentation may be required based upon how an individual answered certain questions on his/her Renewal Questionnaire. If required, instructions on what is required will be displayed and emailed to that individual upon their completing the online qualifying questionnaire. Example: If you answered “YES” to question #1 on the online Qualifying Questions Form you must …….